Dec. 7, 2017, 1:26 p.m.
Like fellow Seattle mainstay KEXP, GeekWire has leveraged its local coverage into international relevance — all the while making itself indispensable to its bedrock Seattle readership. By Ricardo Bilton @rbilton Dec. 7, 2017, 1:26 p.m. In October, a month after Amazon said that it was on the hunt for a new city to launch its second headquarters, tech site GeekWire, also born in Seattle, announced some expansion plans of its own. In search of the “next great North American tech city,” GeekWire invited cities to submit proposals to host a temporary second outpost for the site, which will dispatch reporters in February to cover the chosen city’s tech scene. The request for proposal, which deliberately mirrored Amazon’s own RFP, asked cities to provide information about the large companies they’re home to, housing availability, demographics, and other “intangible considerations” (including ease of access to Whole Foods locations). The site plans to announce the winning city next week, choosing between finalists Raleigh, Cincinnati, Denver, and Pittsburgh. Monica Nickelsburg, GeekWire’s civic engagement editor, said that the HQ2 experiment is both a slightly tongue-in-cheek spoof of Amazon’s effort and a genuine journalistic project to cover a new city’s tech scene. “Part of this project is looking at what it means for a city to be one of the hundred trying to land this unprecedented new corporate headquarters,” she said. GeekWire owes more to Amazon than just its expansion experiment. Launched in 2011, the site’s growth has been inextricably linked to Amazon’s own exponential trajectory over the past decade. As the company has grown, so, too, has popular interest in Seattle as a tech hub. Google, Facebook, Dropbox, and Salesforce have all opened offices in the city over the past few years, joining natives such as Microsoft, T-Mobile, and Expedia. While GeekWire’s location has given it broader appeal, its local focus is also core to its strategy. Seattle real estate developments (“Majority of new homes in Seattle are ‘Built Green’ for the first time, thanks to city incentives”), startups (“Seattle startup Downticket helps voters follow elections and support candidates with an app“), and civic innovation projects (“Lyft expanding Seattle presence with new office lease as it battles ride-hailing rival Uber“) are all core coverage areas for the site. a self-imposed limitation that he argued has helped lead to the decline of legacy news organizations. He and co-founder Todd Bishop were early tech bloggers at the Seattle Post-Intelligencer, and Cook recalled talking to traditional newspaper reporters who were skeptical of a digital approach built around listening to and actively engaging with readers. He said that it was important for GeekWire to build and maintain a strong relationship with the audience it writes for. “A lot of news organizations have lost that spirit,” Cook said. To that end, GeekWire runs around a dozen events a year, the majority of which are focused on bringing together members of Seattle’s tech community. Some, such as the GeekWire Gala, are more traditional networking and cocktail events, while this year’s GeekWire Bash attracted 1,700 people to play games like ping pong, dodgeball, and giant Jenga. GeekWire also runs Geeks Give Back, a charity program that helps raise money for the Washington State Opportunity Scholarship, which offers scholarships to low-income students pursuing degrees in math, science, technology, and engineering. Finding new ways of serving the Seattle tech community is also built into the site’s membership program, which, in addition to members-only exclusives and event discounts, offers with one surprising perk: health benefits, for member companies, via a partnership with Washington insurance provider AllTech. That benefit kicks in with GeekWire’s basic $199/year membership plan. Other plans run for as much as $1,999 annually. Cook compared GeekWire’s local-focus-meets-international-relevance model to Seattle’s public radio music station KEXP, which has become both a vital hub for the local music scene and a tastemaker for the much larger base of music fans. 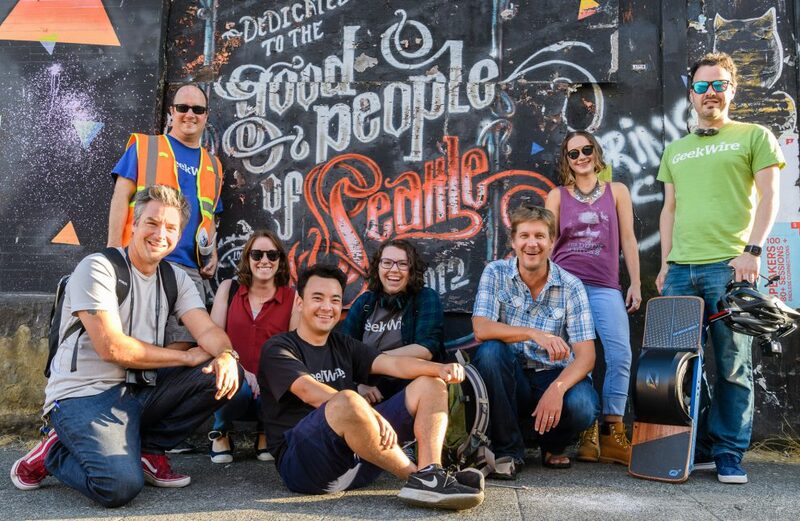 GeekWire isn’t the only news organization that’s explored new ways of building deeper community engagement into its model. 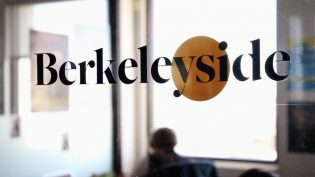 Last year, California local news organization Berkeleyside started offering readers the chance to invest in the company via a method called a direct public offering. Bristol Cable, a nonprofit in the UK, lets readers pitch and assist in the investigation of stories. They’re also able to help deliver the print edition. These efforts are vital because they reaffirm newsrooms’ relationships with readers, who in turn become more invested in the organizations’ continued existence and growth. It’s a lesson that more news organizations can — and should — build into their models, Cook argued. “I never describe us as just a news organization. We’re a news organization and a community,” Cook said. Photo of Geekwire team by Kevin Lisota used with permission. POSTED Dec. 7, 2017, 1:26 p.m.
Bilton, Ricardo. "In Seattle, GeekWire is building an international audience on top of its coverage of the local tech scene." Nieman Journalism Lab. Nieman Foundation for Journalism at Harvard, 7 Dec. 2017. Web. 18 Apr. 2019. Bilton, Ricardo. "In Seattle, GeekWire is building an international audience on top of its coverage of the local tech scene." Nieman Journalism Lab. Last modified December 7, 2017. Accessed April 18, 2019. https://www.niemanlab.org/2017/12/in-seattle-geekwire-is-building-an-international-audience-on-top-of-its-coverage-of-the-local-tech-scene/.